Pakistan conducted 2-5 underground nuclear tests during the morning hours of 28 May, 1998. The Kyrgyzstan Seismic Network (KNET) recorded one test with an estimated magnitude of 4.8. Reports on the yield of the blast vary. This Wikipedia page describes how kiloton yields can be measured. Filtered (0.8 – 3.0 Band Pass, BP) vertical components for the first Pakistani test can be viewed here. An additional test was carried out on the morning of 30 May, 1998. Estimates of the yield of this test are also variable. The second Pakistan test was obscured by aftershocks from the Ms 6.9 earthquake which occured about 30 minutes before the second test. Examination of the KNET waveform data, based on the QED location, shows no observable body waves at the predicted arrival times. Using the first Pakistani explosion for calibration, the amplitude of the second Pakistani explosion is at least a factor of four smaller (0.6 magnitude units) for it not to be observed in the aftershock data. Three stations (AAK, CHM, TKM2) recorded the first Pakistani test. 6-8 stations recorded the Afghanistan earthquake-aftershock-predicted arrivals for 2nd Pakistani nuclear test sequence. Q: Did the Pakistani nuclear test cause the Ms 6.9 Afghanistan earthquake on May 30, 1998? A: No. The Afghanistan earthquake occured 32 minutes BEFORE the Pakistan nuclear test on the same day. The earthquake is located over 700 km away from the Indian and Pakistani nuclear test sites, in a region known for earthquakes. The same region suffered an Ms 6.1 earthquake on February 4, 1998. 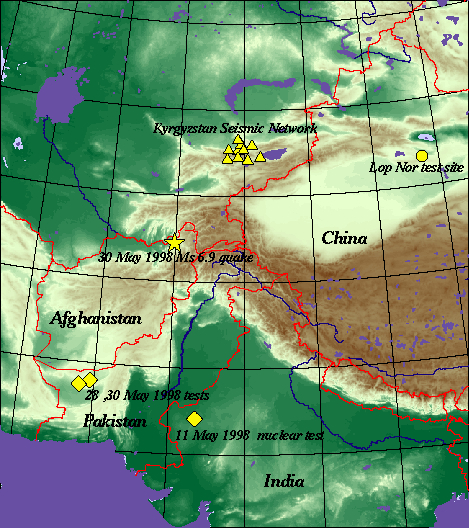 Map showing the locations of the KNET array, the origin for the Afghanistan earthquake, and the nuclear test sites of China, India, and Pakistan. Arrival of the seismic waves for the 28 May, 1998 Pakistani nuclear test nuclear recorded by AAK, CHM, and TKM2. Interactive graph showing the vertical component waveforms for the 30 May, 1998 Afghanistan earthquake. Please view the page illustrating the Afghanistan earthquake-aftershock-2nd Pakistani nuclear test sequence and the page comparing the two nuclear tests and the Afghanistan earthquake. KNET was operational for all 4 events: the Indian nuclear test, the first Pakistani test, the Afghanistan earthquake, and the predicted arrivals for the second Pakistani test. However, due to problems with telemetry, we do not have complete records from all stations for all events. Please visit our page detailing the nuclear tests conducted by India. The AEL is an event list generated by an automated processing of data returned from the IMS Primary seismic stations. An event is added to the list approximately one hour after it has been recorded. It has not been reviewed and should be taken as a first (not final!) estimate of location and magnitude. The DEL is an event list generated by an automated processing of data returned from the IMS Primary and Auxiliary seismic stations. An event is added to the list approximately ten hours after it has been recorded. Again, it has not been reviewed and should be taken as a first (slightly better but not final!) estimate of location and magnitude. The REB is an event list obtained after an analyst has reviewed and possibly revised the automated processing results. The QED is a preliminary event list obtained by USGS. The following table contains locations determined by the Comprehensive Test Ban Treaty Prototype International Data Centre and the USGS National Earthquake Information Center. The times given are UTC (Greenwich Mean Time).